New Yorkers aren't about to let a little rain slow them down, as evidenced by the April 16, 1984, cover of The New Yorker. Shielded by cheerful striped umbrellas, commuters rush along silvery rain-slicked sidewalks and duck into brightly lit stores. 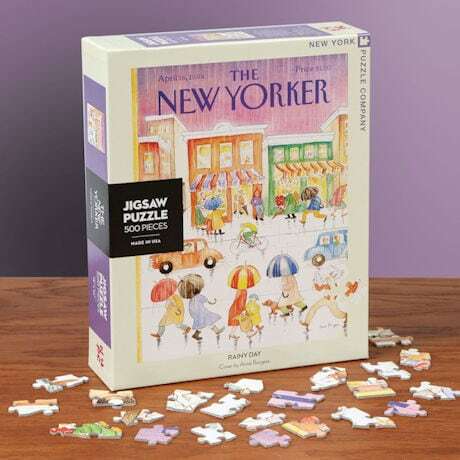 As a 500-piece puzzle, Anne Burgess's colorful illustration provides an excellent way to pass the time when spring showers put a damper on your outdoor activities. Measures 18"x24" when complete.